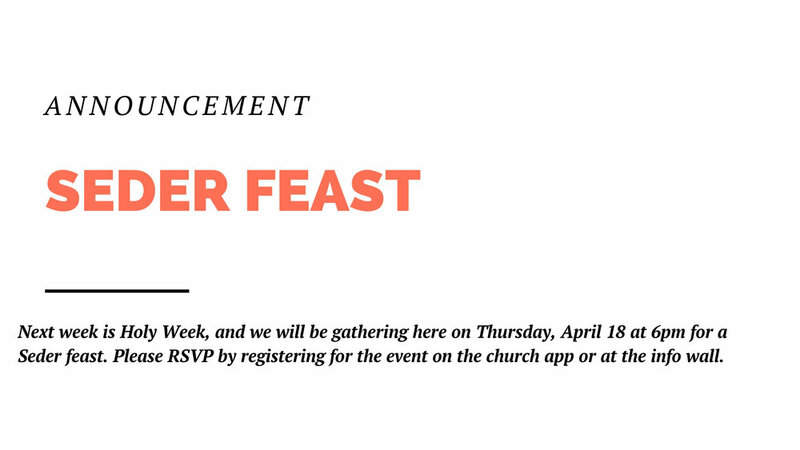 This week is Holy Week, and we will be gathering in our space on Thursday, April 18 at 6pm for a Seder feast, which is a reenactment of the last supper of Jesus. Please RSVP by registering for the event on the church app or at the info wall. We need to know how much food to prepare. And then, of course, one week from today, April 21, is Easter Sunday. And carrying on our now eight year tradition, we’ll be serving Easter pie in celebration of the resurrection. So what we need from you is to bring a pie. A homemade pie, a store bought pie, it’s your call.